So the seeds as-received from Bodhi are already the F1 (F1 when you cross two distinctly different stable lines -- in this case a Congolese landrace and the 88G13HP). Why does the f2 show more variation than the original F1 cross? Also, if you open pollinated your f2s, then f3s etc would you still eventually come to a stabilized line, or is selection necessary? Interesting thread! F3 will depend on the F2 phenotypes used. Open pollinated F2...F3....F4.... would result in more variation then F2. But it does because it's pollinated by many males. Select pollinated F2...F3....F4.... would result in less variation. But it does because it's pollinated by one male each generation. I'm still sorting all of the genetic stuff myself. Thanks! Taking Evolutionary Genetics in college has helped me a ton. F1s tend to suppress recessive traits. Assuming you start with 2 well stabilized lines, then if one plant has a dominant trait and the other one recessive, the dominant trait is the only one you will ever see in the F1 line. However the F1 generation tends appear more stable than it actually is. That's because it now has the recessive trait genetics mixed with the dominant trait in that allele. This is called heterozygous. Once you cross those lines again, suddenly a quarter of your plants will show the recessive trait from the original plant. So the F2 generation will actually show the most variation, because you'll get all kinds of different things coming out if the genetics. Every trait from both the original plants can be seen in the F2 seeds if you grow enough plants. For jungle spice, you could get a plant that looks completely Congolese and another that looks completely like 88g13hp from the same batch of seeds. The difference in the F2 generation is that some of the traits in the plants you grow from the F2 line will now be homozygous again. That means that if you wanted to keep the recessive trait, you have to identify it in both a female and a male and cross only those two. If you did it right, you will never see the dominant trait again in future generations. If you want to select the dominant trait, you will see it in 3/4 of the plants. However two of those three will still be heterozygous like the F1. And when you cross them again you still get the recessive trait in some plants of the F3 generation. Because there are so many different traits to stabilize, it can be quite some work. Usually it takes several generations, and the more plants you cross each generation, the more generations it takes to stabilize... but also, you are less likely to "lock in" a negative trait you don't want. The goal of line breeding is to get all the traits you want "locked in" as homozygous traits, with none of the traits you don't want. If you want to understand why it works this way, read about punnett squares. It'll give you a better idea than I can describe without drawing one out. On a side note, this is why simply crossing 2 strains isn't really the same as breeding, or why some people argue that a F1 shouldn't really be called a new strain. Because it actually takes a lot more work to get consistent results from seed populations. Oops @Sebring beat me to it! Great question and great reply. I'll leave it to him to correct all of the things I said wrong. Weird question: would you prefer to get pollen or a clone back from a tester? Well I think you can do more with a clone (like backcross breeding, mothers AND line breeding), but I guess it depends on the scenario. If it's dried well, and is offspring-tested, pollen is pretty easy to keep and handy to have around. Also if it's been shown to produce good offspring, it's easier to select good females. So having good pollen around can be more valuable sometimes. Also you don't have to grow males, which is never that fun. If the progeny from the pollen hasn't been grown out yet, I probably wouldn't prefer it... unless it expressed some really compelling properties, like a strong smell from a stem rub, trichomes on the leaves or exceptionally dense flowers. Male selection is generally hard, but especially from stable lines I think pollen can be quite valuable. Case in point, look at all of the great crosses from GPS, just by finding a really good stardawg male. Well, I was coming back to comment on how you last reply was so simple and to the point that it seems to make more sense than other explanations,,, and now you go further, and you describe it better than I've been reading. Or, I've been listening to podcasts long enough now and this stuff is starting to sink in. Thanks! I have to come back and re-read this post to let it soak in further. My head is getting froggy now. Imma be hanging with you guys ha. Sebring let the cat out of the bag! And you have now, too. I been needing people to explain it better and you already have. That's why I'm actually more excited than when I made the seeds of my cross. It's not often you have a couple thousand seeds to work with but I do now. It may not be any holy grail, but it's exciting to know that with enough work you're likely to find a pheno that will really satisfy you. Highbrid....er Hybrid vs. just plain 'brid...ed. I'm learning alot here, thanks! Received a very nice package of @lefthandseeds work via @MomOnTheRun this afternoon. Thank you very much folk. Haha, thanks. Glad you liked the packaging. Don't worry, it's resealable though! Just be careful opening the ziplock. I've have a few separate the ziplock mechanism from the bag. Glad I saw this and ran to the mailbox. @MomOnTheRun said Monday. Thank you for everything I can’t wait to grow these great genetics. Only question is which one to do first lol. 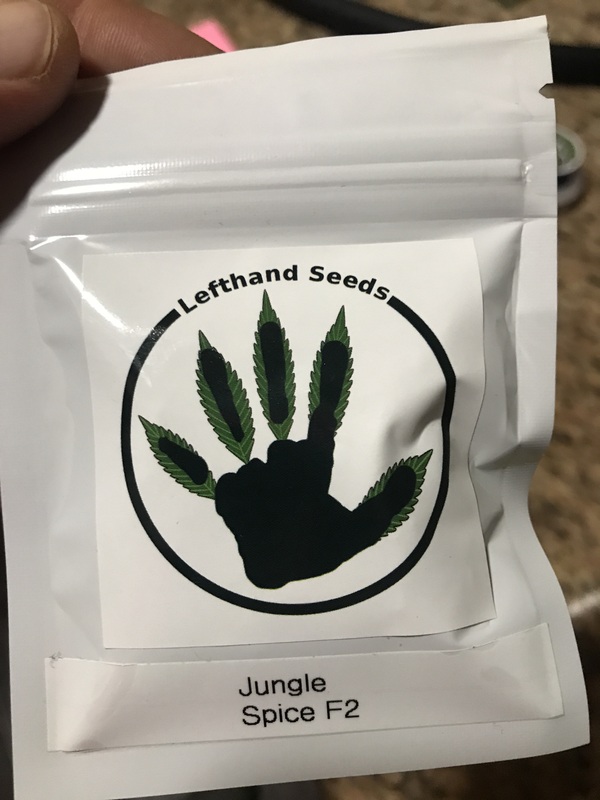 @lefthandseeds thank you for doing this for the community! Holy buckets I opened the pack and there’s so many! Can you explain the color coating system! Nothing like getting some seeds from lefty in the mail. Feels good. I helped package a minute amount of these, worth it for you guys! The black domina is a fantastic smoke - I don't know what happens when you cross a great smoke with another great smoke but those black/red combos should be pretty wild.